I love these. So cute! Thanks! I am so excited to see both of the kids in their whole costumes! Oh my gosh, they look amazing!!! I will have to make one for my 3 year old purple minion fan! Do you have any more tips for how to do the hair? Tips for purple hair: Be patient, brush very gently, and the pom poms could have been shorter! I ended up trimming some of it at the end. I also think it would have been a little easier if I had put the eyes on first, and then put the hair on last. Love it !!! You did an amazing job on the Minions. Thank you for sharing, I’m going to have to make these now for my girls. 😀 lol they saw me looking at your website and they said, “I want one”. Darn, now I have to make them. Thanks, and I am SOOO jealous about your hair! Mine is going to be a $6-Walmart-wig-disaster. Huzzah. Your sheet scarf is much more affordable! Fortunately my mom wants the polka dot scarf when I’m done. I never wear pink because it makes me feel like strawberry shortcake! Curious – have you done logos for the overalls yet? I found the overalls cheap at Target, though my 6 year old (who wants to be the purple minion) is insisting evil minions wear black overalls, so I’m going to dye those. Trying to decide how to best put the logo on them, especially the yellow minion ones (for my 3 year old), because part of me would like it to be removable so he could wear the overalls later! I colored the G on the regular overalls with a sharpie… Still haven’t gotten around to the M on the black ones. I’m thinking about doing that silvery fabric and fusable webbing- maybe making sort-of a patch. I am pretty sure that stuff will peel off if you use a cooler iron! When my husband was a ghostbuster one year, we made his patches stick on with carpet tape. Didn’t budge the entire night! These are awesome! I’m a beginner when it comes to sewing. How did you make the hats? It looks like you have several seams & I can’t figure out how to do it? Thanks! To start, I traced my son’s winter hat onto a sheet of paper for a pattern (folded in half so both sides are symmetrical. I traced the front and back of the hat. Then I cut two of the front and two of the back of the hat and sewed the fronts and backs together (right sides together) so I had two identical hats. Then I turned one of the hats inside out, matched both hats together (right sides together) and sewed along the perimeter of the hat, keeping about four to six inches open so you can turn it right side out. I am pretty sure you can buy a pattern at Joann’s for a similar hat; check the $2.99 pattern section. Hope that helps and good luck! brilliant , but how did you attach the minion glasses? Thanks!! Hot glue gun! I use a high temp one- everything stays so much better than with a low temp gun. Finn has been wearing the hat nonstop, and nothing has moved an inch. Did you attach the teeth on the purple minion before you or after you got the hat all sewn together? You would put them on when you’re sewing the hat together. I got the hat made, then my son told me in HAD to have teeth. And so out came the seam ripper; I took it apart and put it back together. i LOVEEEE THIS!!!! i was wondering what you used for the eyes. are those all felt? why does it look like theres a little sparkle to them? heheh. i was thinking of having my son dress as a minion and newborn as a banana!! 🙂 just went to joanns to buy all the materials!! too bad for my son who wants to be a ninja!! lol. one night he can humor me and be a minion. thanks again!!! Did you sew the tongue into place? Or did you did sew it on upside down or whatever and then flip it and topstitch it? The tongue was an afterthought, which meant getting out the seam ripper and turning everything back inside out. Boo. Gee, thanks! There are some really awesome crocheted ones; I wish I knew how to do that! Just finished my minions last night! The Gru scarf was a sweater I found at goodwill, PERFECT!! Awesome!!! Are you going to be the purple one? The scarf is perfect… Such a great idea to look at goodwill for an old sweater! Just a quick note of thanks for your post. Our girls dressed as minions for Halloween – one good (yellow) and one evil (purple). We used your mason jar glasses idea, as well as the hats. They looked great! Your family photos are priceless! These are adorable! I’ve been trying to figure out what to use for the purple minion hair…the yarn looks great! I just wondered if you have washed the hat and how well the yarn came out washing it? Also, how did you sew the pom poms on the hat to make them so high? Thanks! I know that the hat would be a mess after washing it. I’m sure there are ways to make it durable, but I made it just for Halloween. The hat itself under the pom poms is pretty tall! Adorable! I’d like to make these. What brand is your yellow hat? Thanks for the tips! My oldest son is going as Gru and my other 3 as various minions. 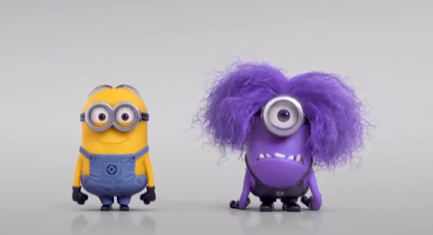 It looks like the eyes for the yellow minion and the single eye for the purple are two different sizes? If so, what were the widths? And did you have to use different size mason jar lids? Thanks! Yep, I was adamant about the eye being bigger on the one-eyed minion… Which was negligible in the end. And I was kicking myself for not realizing sooner the wide-mouth mason jar lids would have worked perfectly on the big eye. I went through all this trouble cutting the plastic end of a mailing tube and spraying it silver only to find it was the same size as that darn mason jar lid!! But the two-eyed minion is the standard size jar lid; it is about 3″ across. Good luck! Absolutely adorable purple hat!! Would pay top dollar for one for my daughter to wear to her gymnastics party with her purple Minion Leo. 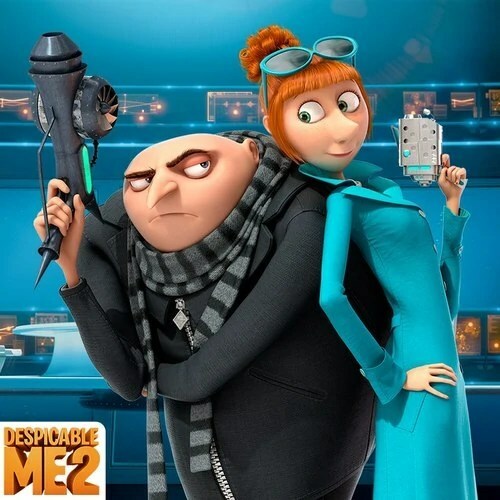 how did you get the Gru nose to stay on ? I made these just in time for halloween. Theu came out so cute! I mada a few changes but thanks so much for this tutorial!!! these are so awesome. How did you attach the jar lids to the hat? Thanks! Would you like to make them to sell for Halloween? 🙂 I’m in need of two! Is it possible to order your 2 hats Minion? Is it possible to order your purple hat Minion? I leave you my email : tikira@gmx.fr.